I have to tell it to you backwards. It looked like this . . . But it went like this . . .
Jimmy (“Everyone’s wearing helmets for a reason”) Spithill, and we’re making tracks toward a destination on San Francisco Bay that will soon be downwind of where we started, but if you’re paying attention to this sentence you will notice that I didn’t say we are sailing “downwind.” Most of the time the speedo reads 28-something, and twice we hit 29-something. The afternoon seabreeze is still building. 4) I have my hand on the hiking stick of AC45 #4, and Jimmy Spithill at my elbow is telling me to press a little harder, and a little harder, and we’re just shy of the Golden Gate Bridge and “pressing” means to turn the boat farther away from the wind, more toward “downwind” and back into the bay and I’ve finally extricated my foot from the loop in the line that grabbed me when I was crossing the net in the tack and I’m pretty sure that Spithill has no intention of allowing me to send this machine down San Francisco Bay with five souls aboard even if they are pros and better paid than I am but he keeps telling me to press a bit more and I can feel the boat accelerating, loose as a thoroughbred at a bugle call and Spithill is saying, “Don’t worry, mate, you’re fine, just press a little more” and I can see from the action forward that a bigger headsail is in the works and about to be deployed and I dutifully press a bit more and the boat just wants to go and at last the man says, “Okay, I’ll take it from here.” Hallelujah. 3) We’re sailing upwind in the Alcatraz Channel on a normal seabreeze day for San Francisco Bay. High teens, low twenties, what’s the difference. From my original position, mid-boat, gripping the net, I’ve moved aft to take over the helm, to a degree. That is, Spithill invites me to drive and of course I accept, but it’s not as though he’s going to leave me there all alone. The first thing he says is, “You have to hike.” Which is good. Feet under the straps, the hull fits the body, fits the mission, fits the moment. Lean back. Kinda relax. And I quickly prove what I’ve heard before from the likes of Paul Cayard, even from the likes of hacks like me who have traveled this road ahead of me. The boat handles like a dream. With two fingers on the hiking stick, not a lot of tiller movement and no drama at all, we’re reading 16 knots. Which is where Jimmy handed it over. I’m feeling good. I’ve eaten a lot of s*** in my life, but never with a s*** eating grin like the one I’m wearing now. Then Murray Jones says, oh so politely, “It’s good to keep it at 16.” Um, right, we’re reading 15. Nudge her down a bit. Oops. We’re reading 17. Murray Jones says, oh so politely, “16 is good.” Uh huh. 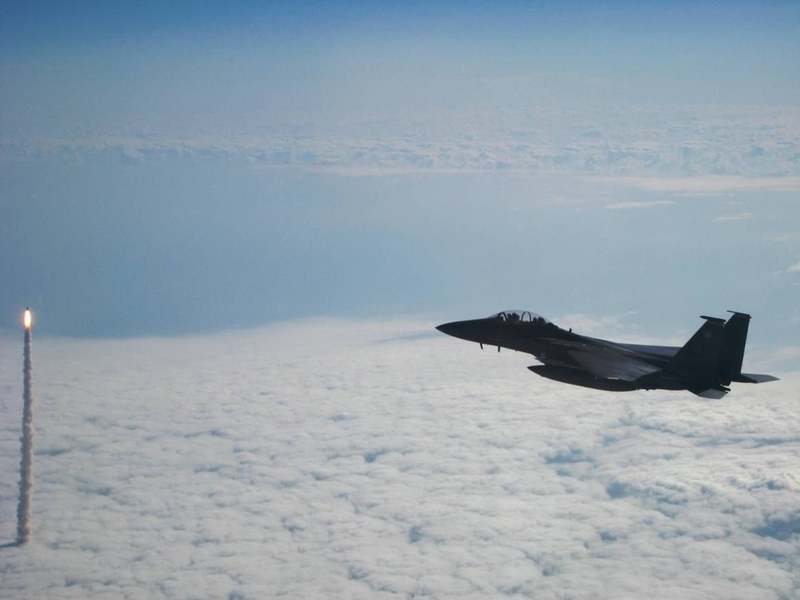 He has his hands on the wing, so to speak, so I am merely steering. He’s driving. We pass through 16. That felt good for a minute or fraction thereof. There it is again. I can almost hold it. But it says a lot that even I could hop aboard and take the helm and keep this beast within a knot, either side of target speed. With the support of five practiced pros, but please, let’s not be picky. 2) I’m gripping a rail on a fast RIB, and we’re pacing AC45 #4 upwind at 16 knots. Soon we’ll slow down for my transfer to the raceboat, but for now it’s a startling sight. Forty-five feet of carbon fiber with a big, black wing carving wind and at the helm is Jimmy Spithill, the quiet Aussie who steered the trimaran that won the America’s Cup in February, 2010 in Valencia, and what is before me now bears witness to the reality of America’s Cup on San Francisco Bay. 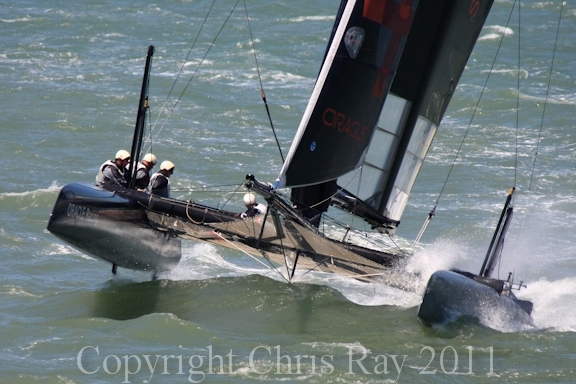 In the crew I can easily pick out John Kostecki, who sailed the 2010 match as tactician and continues now in that role for Oracle Racing, and yes, I knew John long before he won his first world championship at , I think it was, fifteen. Long before he won an Olympic medal, a race around the world, an America’s Cup. 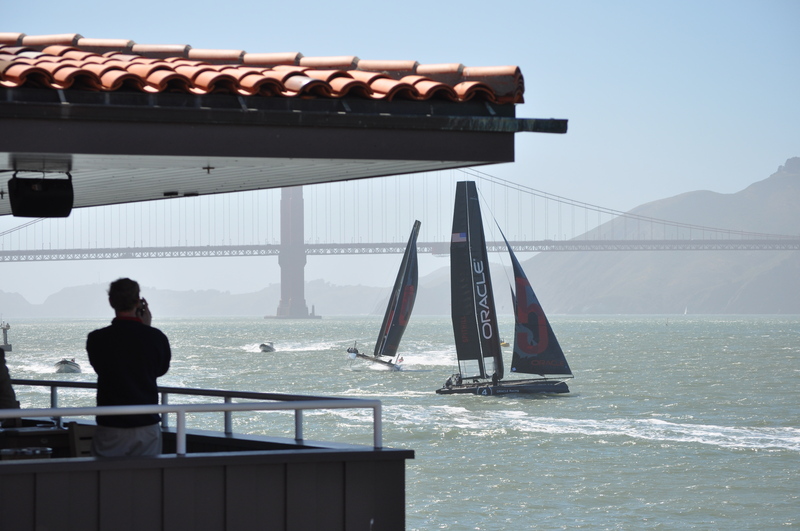 Bringing America’s Cup to San Francisco Bay. Long before Tommy Blackaller made the first attempt. And here it is now, all around me, the familiar background. The blue spires of downtown and the gentle rise of the hills to the west. The red span of the bridge. The open parklands at either hand. The whitecaps rolling in. 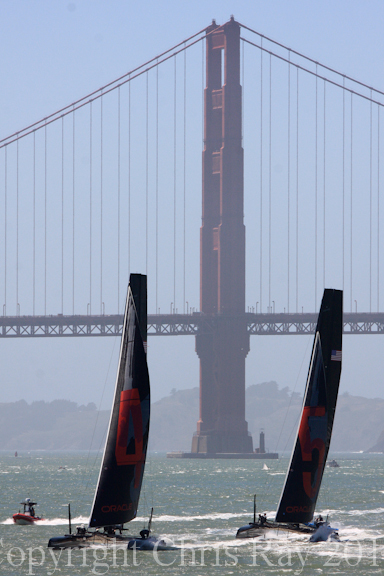 And this shocking black monster that just screams America’s Cup on San Francisco Bay. 1) I was not prepared for this. I’m choking. No, I’m crying. The boat driver looks at me. I wipe it away. I say, “Just a little spray.” It’s been a long time coming. On Monday, Olympic gold medalist freestyle skier Jonny Moseley emceed a press conference for Oracle Racing. Jonny’s a sailor, and he comes from a sailing family, with pedigree. Of this moment in America’s Cup development, he remarked, “It reminds me of what happened in skiing in the 1990s.” Faster. Looser. Bigger air. Nothing special about this pic, but I like the context . . .
Mayor Ed Lee got a crack at the helm also, but that was Monday, and my ride was on Wednesday, and while I was suiting up to sail, the mayor joined the America’s Cup Event Authority at a press conference in the Ferry Building to announce the list of teams entered for the next America’s Cup, or at least for the World Series tour for AC45s that begins in August in Cascais, Portugal. Endeavor lifts off on her final mission . . .